Lee’s invasion of the North intended to close the war. Last edited by pamoa on Mon Dec 10, 2012 12:04 pm, edited 28 times in total. Looks cool. I like that it's not insanely big and complex. I'm not a big fan of games that require more time reading than actual playing. Maybe lighten the blue in the tert. boxes a little. But that's something that can be done when it gets to that phase. So, are corp commanders considered to be artillery? 1. The city is "Hanover" not "Hannover". It's named after Hannover, Germany but they Americanized the spelling. 2. Does Cavalry have any special attack or role? Otherwise I think they'll just be ignored the entire game. I'd try to think of something that they can do. 3. Possibly put a cannon beside/near the Corps Commanders and maybe the Army commanders to show the bombardment option? 4. Try to make the map background a little darker so we get more of the map feel? I think it's too light right now, I'd rather see more of a map with the gameplay as an overlay. 5. 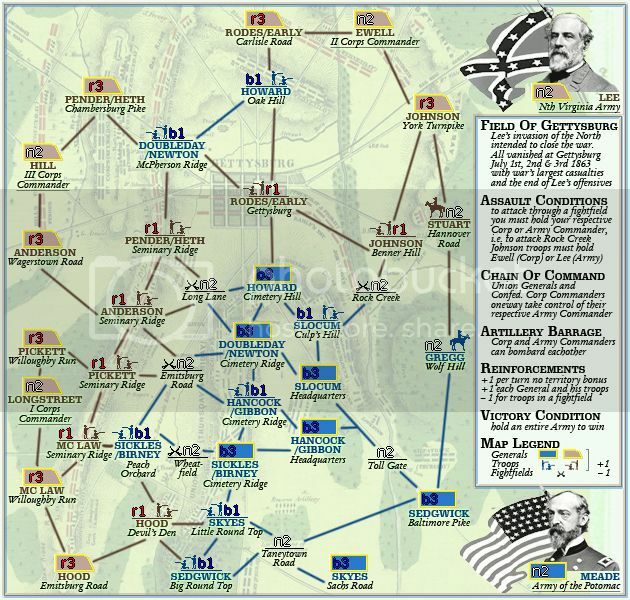 Lee is attacked by 3 people, while Meade is attacked by 7. It's unbalanced, but I'm not sure it will be a huge issue. 6. I would call them "battlefields" or something similar. "Fightfield" isn't a term used in English. 7. In the legend, under Reinforcements, change the first line to read "+1 per turn, no territory bonus" or "+1 per turn (no territory bonus)"
8. 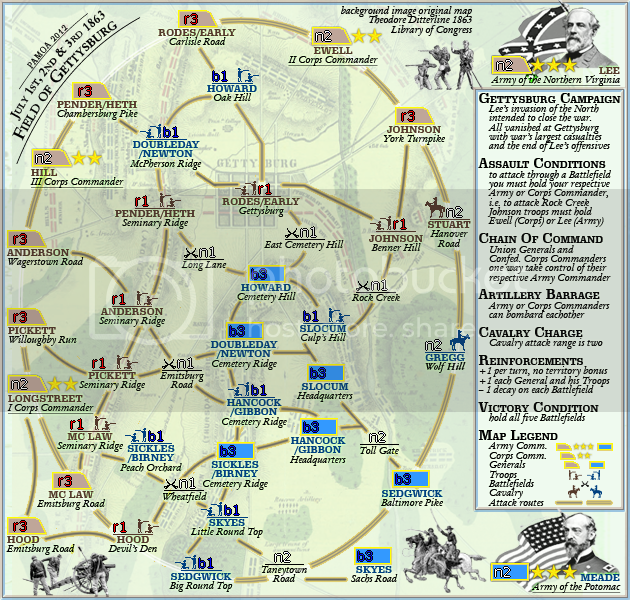 The title should be "Battle of Gettysburg" as that is what it is commonly called. 9. Under "Chain of Command" I would say that they "... one way attack their respective ..."
10. I would remove the +1 and -1 in the "Map Legend" area since you have that under reinforcements. I think it's slightly confusing. I really like the idea, and I think it has a lot of the things that I liked about Austerlitz with none of the things that I didn't. the theme is great and map looks very promissing. I have a little problem to read legend. the background should be more visible. or draw basic things as roads, woods. what needs to hold Slocum army to attacks Rock Creek? I assume Meade, but which union general? I think you should add more things to legend. all symbols used on map would be explained in legend. maybe you can use different symbols for Corps Commanders and other generals. I will look at map more today. ironsij0287 wrote: Looks cool. I like that it's not insanely big and complex. I'm not a big fan of games that require more time reading than actual playing. Ace Rimmer wrote: I really like the idea, and I think it has a lot of the things that I liked about Austerlitz with none of the things that I didn't. Frito Bandito wrote: So, are corp commanders considered to be artillery? Ace Rimmer wrote: Possibly put a cannon beside/near the Corps Commanders and maybe the Army commanders to show the bombardment option? Ace Rimmer wrote: Does Cavalry have any special attack or role? Otherwise I think they'll just be ignored the entire game. I'd try to think of something that they can do. Ace Rimmer wrote: Lee is attacked by 3 people, while Meade is attacked by 7. It's unbalanced, but I'm not sure it will be a huge issue. Oneyed wrote: what needs to hold Slocum army to attacks Rock Creek? 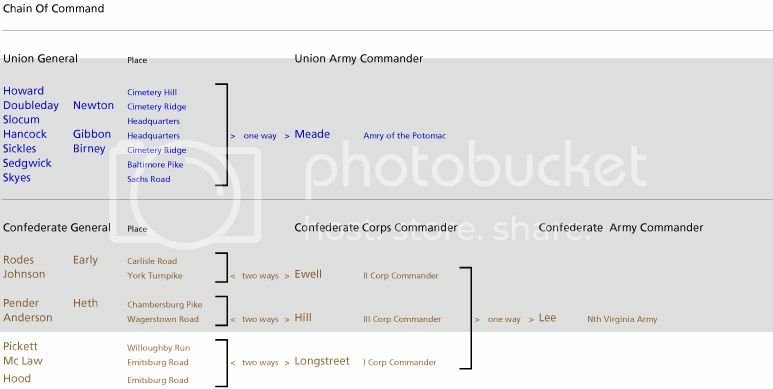 I assume Meade, but which union general? Ace Rimmer wrote: The city is "Hanover" not "Hannover". It's named after Hannover, Germany but they Americanized the spelling. Ace Rimmer wrote: In the legend, under Reinforcements, change the first line to read "+1 per turn, no territory bonus" or "+1 per turn (no territory bonus)"
Ace Rimmer wrote: Under "Chain of Command" I would say that they "... one way attack their respective ..."
Ace Rimmer wrote: The title should be "Battle of Gettysburg" as that is what it is commonly called. Ace Rimmer wrote: I would call them "battlefields" or something similar. "Fightfield" isn't a term used in English. Oneyed wrote: I have a little problem to read legend. Oneyed wrote: I think you should add more things to legend. all symbols used on map would be explained in legend. Oneyed wrote: maybe you can use different symbols for Corps Commanders and other generals. ironsij0287 wrote: Maybe lighten the blue in the tert. boxes a little. But that's something that can be done when it gets to that phase. Ace Rimmer wrote: Try to make the map background a little darker so we get more of the map feel? I think it's too light right now, I'd rather see more of a map with the gameplay as an overlay. Oneyed wrote: the background should be more visible. or draw basic things as roads, woods. Ace Rimmer wrote: I would remove the +1 and -1 in the "Map Legend" area since you have that under reinforcements. I think it's slightly confusing. pamoa, nice map and want to see this go on but I have some observations that I hope you can clear up for me. 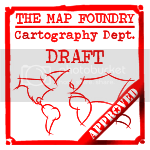 These are all for my benefit to help me understand the map better and therefore help you better. Union Generals and confed corp commanders one way take control of their respective army commanders. If I am reading this right, Hill 3 corps commander one way attacks Pender/Heath and Anderson. So who attacks Hill? Even with your example, it took me about 5 minutes to work out all of the others and right now I am still not sure. Andersons troops need Hill to attack through Long Lane. Correct? Territ bonus is fine but might be a little low and games might start very slow. +1 for generals and his troops. This is going to give an advantage to the player going first is it not? 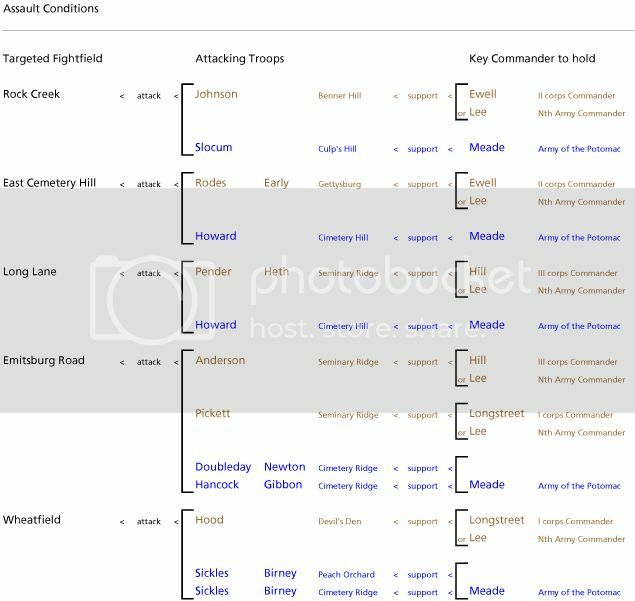 If I am reading the map right, the general will start with 3 troops and the army one troop. Will these be coded together so a player gets both for the +1 straight out? -1 for troops in a fightfield (battlefield sounds better). Decay or bonus? Please be clear on this point. If you get this far, you have already won the game and seems pointless to have it. How about holding Lee and Meade for the win? Only able to attack them if you hold any two commanders on the field. Skyes is behind a 2 neutral and gets an advantage. Legend text. very small and hard to read. Why not make Lee and Meade smaller and the legend bigger to solve this. koontz1973 wrote: Chain of Command. +1 for generals and his troops. This is going to give an advantage to the player going first is it not? koontz1973 wrote: If I am reading the map right, the general will start with 3 troops and the army one troop. Will these be coded together so a player gets both for the +1 straight out? "28 starting positions coded by pair = 7 + 7 General & Troops pairs"
koontz1973 wrote: -1 for troops in a fightfield (battlefield sounds better). Decay or bonus? Please be clear on this point. koontz1973 wrote: Skyes is behind a 2 neutral and gets an advantage. koontz1973 wrote: Images. Any copyrights involved? koontz1973 wrote: Legend text. very small and hard to read. Why not make Lee and Meade smaller and the legend bigger to solve this. sm8900 by pm wrote: if you put Stuart in on the battlefield, why not put in Custer as well? since he's the one who fought Stuart. Thanks for the info pamoa. I knew I was wrong about the attacks but I thought it better to ask. Is there anyway to make it clearer either graphically or legend wording so players can understand it without having to look at a graph? 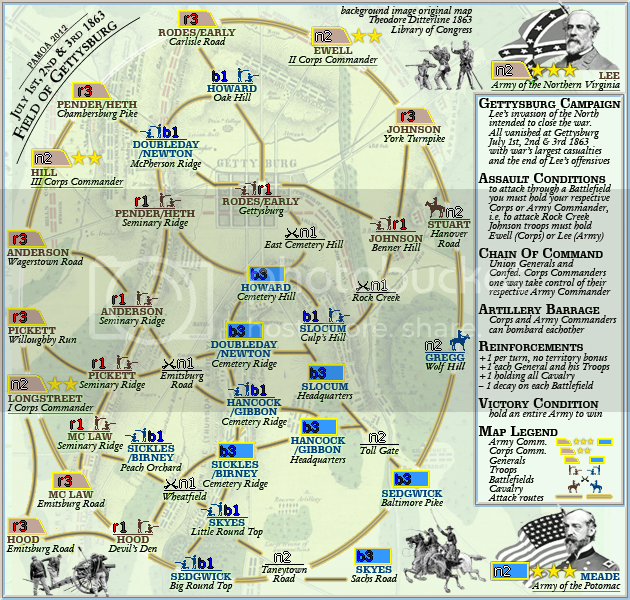 28 starting positions coded by pair = 7 + 7 General & Troops pairs. What about 8 player games? Everyone will start random and only have the +1, and someone may drop a bonus whilst others not. Out of the 7 starting positions, how many will be given out in 1v1 games? If it is 3 each, player one starts with 4 troops and has an overwhelming advantage from the start? With the fightfields, is there any way these can be moved so players have to use them. Right now, you do not need to and with a 2 neutral on them and the small bonuses, why would a player use them? Some one way arrows to explain those attack routes would be of a great help in understanding things. Skyes has a slight advantage for a player who starts with him because of the neutrals, but it is only slight and I noticed that Sedgewick also has it. No big thing but something to keep in mind later in GP. Why would this map not go any further? You have support for it but I will ask you to get any copyrights sorted out ASAP. koontz1973 wrote: Territ bonus is fine but might be a little low and games might start very slow. koontz1973 wrote: Thanks for the info pamoa. I knew I was wrong about the attacks but I thought it better to ask. Is there anyway to make it clearer either graphically or legend wording so players can understand it without having to look at a graph? 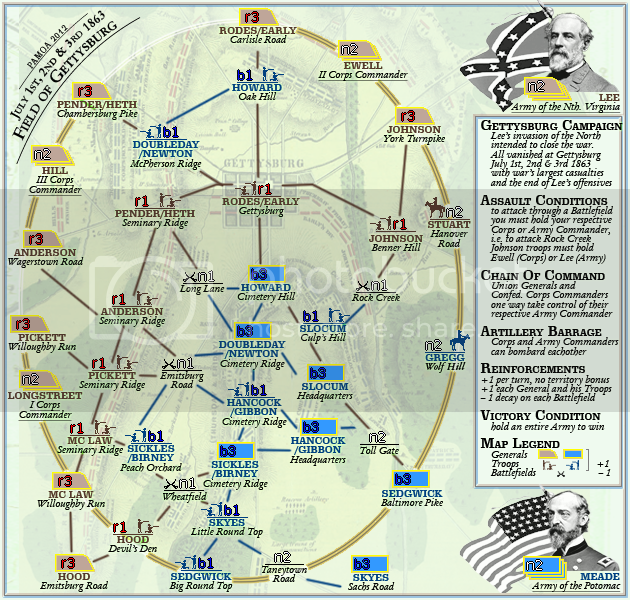 28 starting positions = 14 coded by pair = 7 Union + 7 Confederate General & Troops pairs. koontz1973 wrote: With the fightfields, is there any way these can be moved so players have to use them. Right now, you do not need to and with a 2 neutral on them and the small bonuses, why would a player use them? koontz1973 wrote: Some one way arrows to explain those attack routes would be of a great help in understanding things. koontz1973 wrote: Skyes has a slight advantage for a player who starts with him because of the neutrals, but it is only slight and I noticed that Sedgewick also has it. No big thing but something to keep in mind later in GP. None as of yet but will think on it. Wait for the game play mods to look at it and see what they say. Thanks. This might give a big advantage to player one but wait again and see what ian and nole say. Sorry, I meant for the Anderson to Hill connections. A small arrow head at the end to denote it is one way would suffice. I did understand you, but you are already in the graphics phase of things. Sorry pamoa for not making myself clear, but I cannot let this out till the copyrights are sorted. I am sure a different jpeg can be found or why not start on the background now. koontz1973 wrote: I did understand you, but you are already in the graphics phase of things. Sorry pamoa for not making myself clear, but I cannot let this out till the copyrights are sorted. I am sure a different jpeg can be found or why not start on the background now. I'm going to help out here a bit. I went and took a look at the link pamoa posted and it is in public domain so pamoa is free to use it as he pleases! Thats great news pamoa. Now that is one thing you can cross of your list of things to do here. Nope, leave it as is. But consider me one of the average players that likes to play lots of maps and if I have had this trouble understanding, consider the rest of the poor slobs. But, this is more for the game play side of the foundry. ok, sounds great. thanks for this great map!!! pamoa, can I please ask you to update the title of the thread for me. Name, date, version number, page of current version. what about to add Wheatfield between SICKLES/BIRNEY and MC LAW? I see it. I mean to move it from between Sickles/Birney Peach Orchard and Sickles/Birney Cemetery Ridge to between SICKLES/BIRNEY Peach Orchad and MC LAW. I think you should use battlefields for fightfields, because name of map is Field of Gettysburg, not Battlefield of Gettysburg. to between SICKLES/BIRNEY Peach Orchad and MC LAW. Oneyed wrote: I think you should use battlefields for fightfields, because name of map is Field of Gettysburg, not Battlefield of Gettysburg.